The quintessentially British appreciation of a good cup of tea is well rooted in history. The centuries have seen debate and disagreement over how exactly to prepare the perfect tea; do people prefer it black, with cold milk, hot milk, or even cream? These changing trends have resulted in the evolution of the milk jug and the creamer. After the original introduction of tea to European traders, specifically Portuguese merchants and priests during the 16th Century, it was the custom to drink only black tea and the addition of milk to the beverage was not even considered. Many mid-17th century paintings featured the consumption of tea; however the tables were vacant of milk jugs or any sign of milk at all. One of the earliest references to the addition of milk was in 1684 when Madame de Sevigne recommended the practice to her daughter in a letter, although it is clear that this was not the norm. 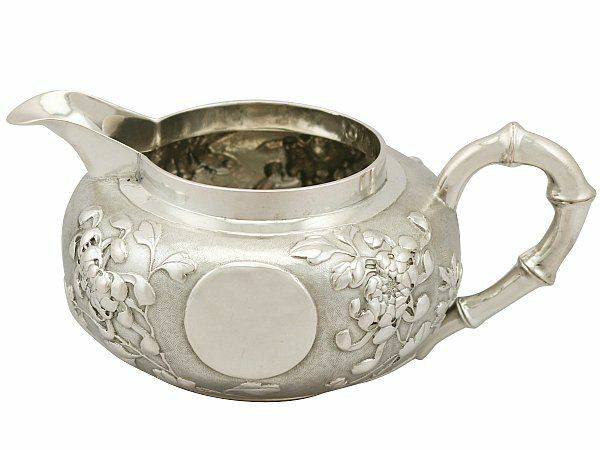 The European style of drinking tea at this time was heavily influenced by the contact they had with Chinese traders. Some European traders copied the tea rituals of the Qing Dynasty (1644-1800) who drank black tea with milk, initiating this practice within Europe. The Dutch drink ‘Melkthee’ for example, is generally credited to Dutch traders’ interaction with the Chinese Emperor in 1655. During a feast presented to the Dutch delegates by the Emperor the tea was described to have been consumed along with warm milk and a little bit of salt. It would then be drunk at the hottest manageable temperature. After this initial introduction the idea of milk in tea grew in popularity. Throughout England the trend for black tea with milk quickly developed, despite Chinese still preferring green tea. As well as people enjoying the flavour of milk with tea, they also believed it to have many medical benefits. In 1660 Thomas wrote that tea “prepared with milk and water strengthened the inward parts and prevents consumption, and powerfully asswageth the pains of the bowels, or griping of the guts and looseness”. Soon after this growth in the trend the first reference to a vessel used specifically for containing milk to go with tea can be found. In 1698, in a letter to her daughter, Lady Russell described “little bottles to pour milk out for tea” exclaiming her delight at the quaintness of the very first milk bottles. 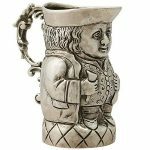 By 1702, silver jugs known as ‘milk potts’ or ‘milk ewers’ were entered by the London Assay Office and by 1796 the East India Company had introduced porcelain milk jugs and pots in their cargo. 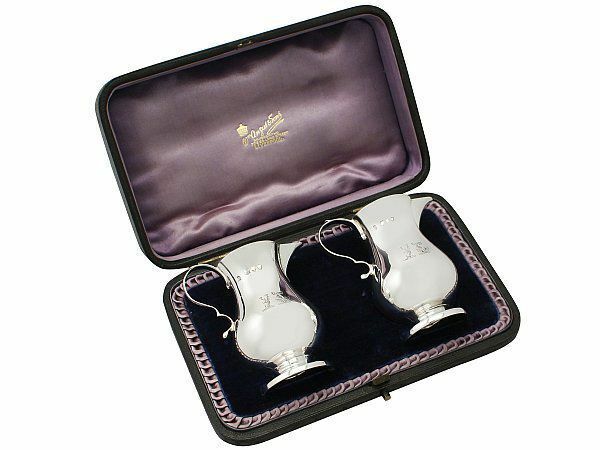 Along with the use of porcelain, silver was used to make some of the first milk jugs and creamers. The earliest examples of these were very small and narrow (about 2 ½ to 3 ½ in tall) with ‘D’ shaped handles. And sharp, beak-like spouts. They also featured a domed lid as it was the fashion to keep the milk piping hot before it was added to tea. The shape and style of the milk jug altered over time; from the original design they changed to a pear shape, then a helmet shape, then a boat shape. The lid was also discarded as trends changed towards cold milk and cream rather than hot milk. It is clear that by this point the beverage we now know as English breakfast tea had become a norm throughout British society. By the 1760s creamers and jugs had taken on a barrel shape, with slender necks and a curling lip. 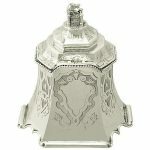 It was during the 1770s however that a delightful new design of creamer was introduced by the Dutch craftsman John Schuppe. 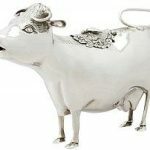 Schuppe’s design was the ‘cow creamer’ which was in the shape of a friendly cow crafted out of silver. Each part of the cow was crafted separately and then soldered together with a hinged saddle fitted as a lid and (in most cases) a small bee or a fly attached as the knob. 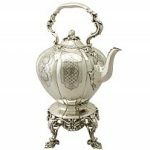 By the 19th and 20th Centuries tea with milk had become such a commonplace in England that tea sets (which were also quickly growing in popularity) all now included a milk jug (either made from silver, porcelain or stoneware). While the rest of Europe still mainly chooses to drink tea black, the English have settled with their stronger brew with milk and sometimes sugar. Of course, there is still ongoing debate over the ‘correct’ way to make that perfect brew. Some opt for pouring the milk in first, which past etiquette suggests is the ‘polite’ way. This order is also scientifically recommended for a better natural blending of milk and tea. However, each tea drinker has their personal preference (and probably swears by it!). Whichever method you choose though, a milk jug, or some kind of vessel to contain the milk is a necessity. 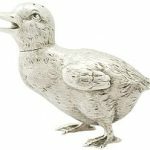 With such a variety of styles to this vessel, from the quirky friendly cow design to the more elegant pear shape, it can add to your own personal take on a cup of tea, however you take it!